Lately, I haven’t been one to eat conventional boxed cereal. I’ve been leaning towards alternative breakfast ideas like breakfast quesadillas with peanut butter and bananas, green smoothies, stove-top oatmeal, and homemade granola (my personal favorite, aside from pancakes that is). 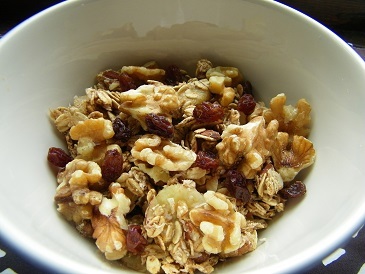 I love the crunchiness of granola, as well as its sweet flavor, but I find that most store bought granolas are full of sugar and have many grams of fat. I sought out to make granola without using any oil. Instead of using oil to bind the mixture, I used mashed banana, which gave the breakfast cereal a lightly sweet flavor. Luckily, it was a success. I made it everyday this week for breakfast. I fully expect to make it tomorrow morning too. It tastes like banana bread topped with toasted walnuts. 1- Preheat the oven to 325 degrees. Then cut the banana in half and add one half to a mixing bowl. Mash it with a fork or potato masher. Then add the vanilla, cinnamon, and maple syrup. Stir well. 2- Add the rolled oats, the coconut, and the chopped walnuts. Mix all of those ingredients together. Then, slice up the other half of the banana and add it to the bowl. Stir once more before spreading the granola onto a baking sheet. 3- Bake for about 12 minutes or until the granola begins to turn golden brown. Top with extra walnuts (if desired). Serve immediately or let it cool a bit and it will crisp up even more. Some serving suggestions would be to add cacao nibs, ground flax seeds, or raisins before serving with the milk of your choice. Enjoy! A great idea to use the maple syrup here that gives a lovely coating to the granola instead of the oil Tasty too! MMMMMM! I agree using maple syrup was tasty! It added flavor and sweetness. It never disappoints me and I’ve been eating it for breakfast nearly everyday for the last two weeks. You should definitely give it a try! Thanks for stopping by my blog as well 🙂 I checked out yours and loved the recipe for lavender shortbread cookies. That is another food that probably smells as good as it looks. Can’t wait to try the granola…it just might be a new breakfast fav!